Whether you want a brand-new ride or a gently used RV, we have you covered. Choose from top brands with the best features for your family’s safety and comfort. You’ll create memories to last a lifetime. Who wants to sleep in a tent when you can upgrade to a convenient travel trailer? Tow one of these along and avoid camp set-ups or expensive hotel fees. Our selection of lightweight travel trailers in Beckham County, OK includes something for every budget. This style works great with your pickup truck. 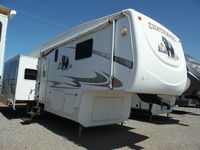 Simply couple your RV to your vehicle and your new 5th wheel creates a mobile home away from home. It’s that easy! From pop-ups to pop-outs, Elk City RV Sales & Rentals offers myriad options for your camping needs. Collapsible profiles make these styles easier to store. Smaller units are also perfect for those with smaller budgets or smaller towing vehicles. Contact the RV experts at Elk City RV Sales & Rentals before your next journey. Give us a call today at 580-243-3300 to hear a list of all available brands, sizes, or price estimates. "Excellent service! We needed an emergency major repair to our RV roof while on a cross country trip. We made arrangements on a Monday after..."
"While traveling to Arizona from Ohio last January in our motorhome , the refrigerator stopped working on a Sunday. We stopped at the Wal Mar..."
May 22, 2017 Don B. "What a great bunch of people. We were passing through when our refrigerator went out. We are from out of state, so we expected a response of..."
"Pretty busy place but they made time for us to help us out as we were passing through from OKC on our way to Amarillo. Our hot water heater ..."
"Very friendly staff and always helpful. They have almost everything you could need for your camper and affordable! My go-to place."